I really hope they make these. I got a copy of the first from Otaku Mode and it is a grand book. Plus it would be nice to finally have the content from the last few chapters. 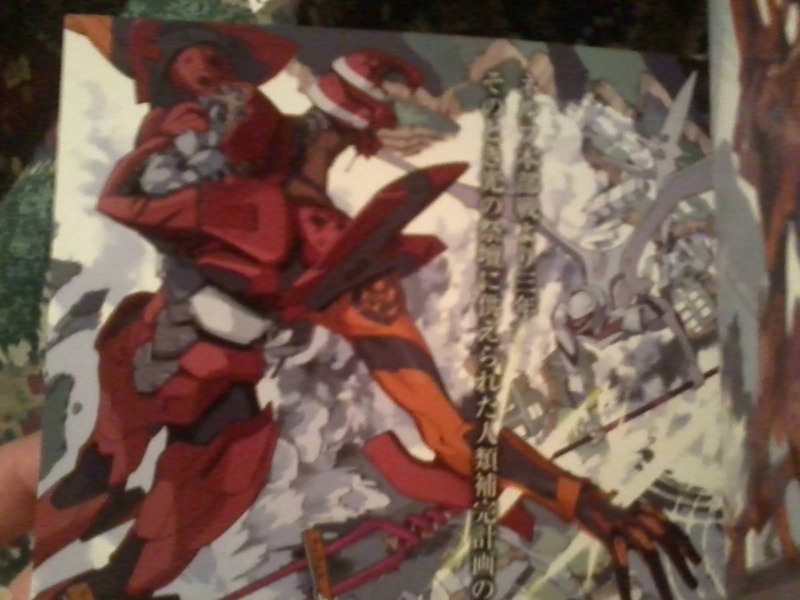 From the short summary I got, it seems that Shinji's Super Eva "evolved" into Adam, or a Giant of Light much like the awakened evas in Rebuild. But it seems that there are two forms of Super Eva's pseudo-evolution in ANIMA. 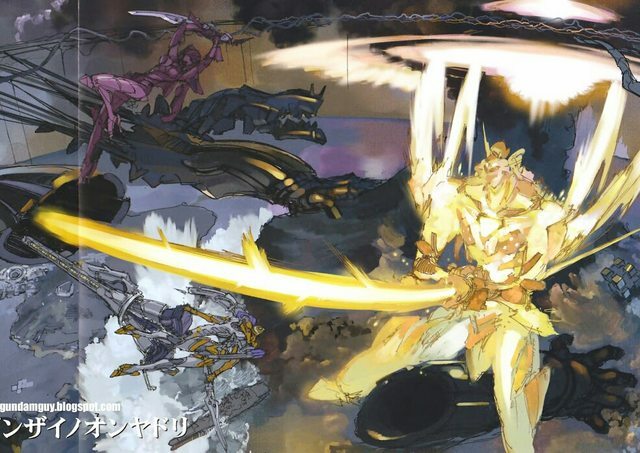 The first image depicts SI Adam himself manifesting as an energy being shrouding the Super Eva, and the second image depicts the Super Eva radiating light from itself, much like Eva 13's awakened form. Can anybody explain to me what's going on exactly? From what I understand, Shinji was originally the "human" part of Adam that was cast off in order to bring it closer to divinity. When Eva Unit 01 is badly damaged, it takes Shinji's heart into itself and evolves into Super Eva. Later on in the story, it evolves again into Super Eva Final ver. which is what you see in the bottom image. Since Shinji was a part of Adam and is now a part of Unit 01, I think the idea was that it made Unit 01 a sort of proxy Adam. IIRC, the first picture was what triggered the evolution from Super to Final, and the second is just Final's version of the Giant of Light. So, uh, who do the Evas fight if the angels are gone? I can tell there are Evas in the story from the pictures I've seen while looking ANIMA up. Tumbling Down wrote: So, uh, who do the Evas fight if the angels are gone? Also, though this might not have a definitive answer, why is manga more often translated into/licensed in English than light novels? Manga has considerably less text per page than prose, and, furthermore, is almost entirely spoken dialogue, rather than more complicated narrative description and internal monologue and so forth. That alone can make it more economic to translate. Translated light novels may also be an unproven market, but I don't know as much about that. Reichu wrote: Translated light novels may also be an unproven market, but I don't know as much about that. None the less, there are some. I have Welcome to the NHK and the novelisation of FLCL, and there seems to be a commitment to producing the -monogatari series (I have the first three, and three more on pre-order). pwhodges wrote: None the less, there are some. I have Welcome to the NHK and the novelisation of FLCL, and there seems to be a commitment to producing the -monogatari series (I have the first three, and three more on pre-order). I have the full run of Haruhi Suzumiya, along with All You Need is Kill. There are a fair number of LN translations out there, but whether or not any given one's translated is kind of a crap shoot. Anima is finally coming out on November 30th. Anima vol. 1, 296 pages. Anima vol. 2, 328 pages. It's nice to finally have it all compiled, but disappointing that it will be in tiny, TINY B6 format. Hopefully we'll at least get a large format artbook on the side someday. And TMBounty_Hunter, is Unit-08 really your waifu? The very last part of that tweet, is he saying there will be 5 volumes total? DarkBluePhoenix, yes, she's my waifu and mine alone. EDIT: Actually doing some math of giant magazine page character density vs B6 novel page character density the numbers work out almost perfectly for five 300-page books, so no need for accurate non-machine translation lol. 4200 yen isn't even that expensive. TMBounty_Hunter wrote: Hopefully we'll at least get a large format artbook on the side someday. No. I already have that one and I don't consider it either large format or an artbook. It has some lineart, and some tiny, tiny illustrations. There's definitely room for a proper artbook, especially given the fact that in the monthly serializations some of the illustrations got shoved into the black and white pages while the originals are full color. My fingers crossed on the 5 books getting a western release someday (I'd assume the interest HAS to be there, it's Eva! ); I'd love to read 'em. Sailor Star Dust wrote: My fingers crossed on the 5 books getting a western release someday (I'd assume the interest HAS to be there, it's Eva! ); I'd love to read 'em. I'm sure the western publishers will look at Japanese sales of the book and then immediately understand that this will never be financially viable. My books are supposed to be here some time today. Waiting intensifies. I can't wait to see what they look like in person. Edit: They just arrived a few minutes ago and my initial impression is...I'm a bit underwhelmed actually. They're about the size of your normal paperback novel with roughly the same quality paper. There is a nice glossy cover with a dust jacket and some glossy pages at the front. Each volume has about 8 glossy pages of artwork at the beginning, most of it just the designs of the new Evas and a bit of character art. Volume 01 has some art I've not seen before and might be new. 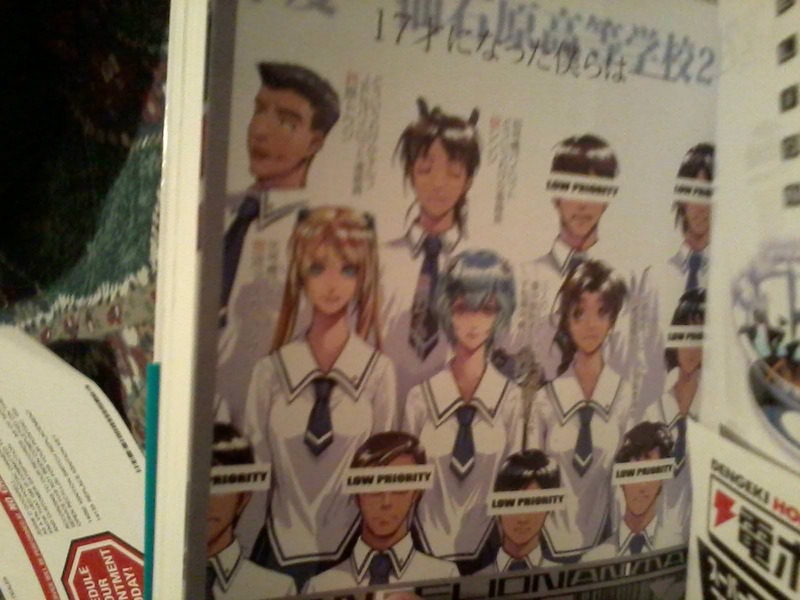 One depicts Shinji, Asuka, Rei as teenagers along with their classmates, and all of the unnamed characters have a black bar over their face that says "low priority." There are also some images with a city on the edge of the water with some kind of dome in the middle. I think this might be the rebuilt Tokyo-3? 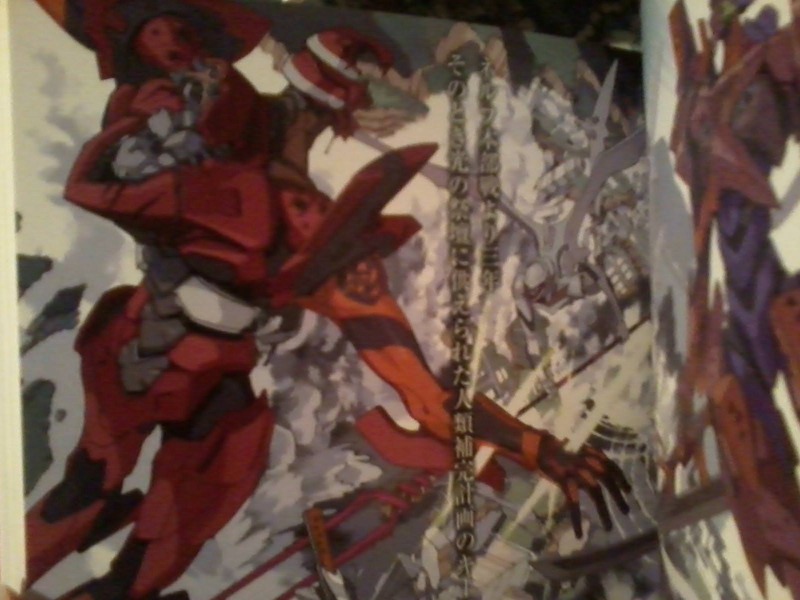 The most interesting is a two-page spread depicting the Children's battle against the Mass Production Evas. 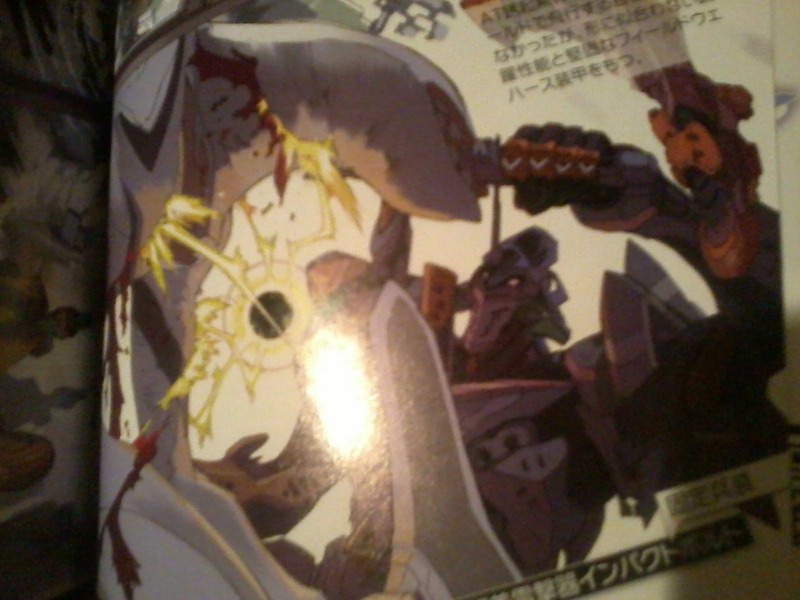 One page has Unit 01 equipped in the F-type armor, but with a weird mask or guard plate over her mouth. It's engaging one of the MP Evas with the knife and charging some kind of black energy ball by its chest. Unit 02 is hanging in the air crucified on white crosses of light. A chunk of the right side of its head has been blown away and it's being charged by an MP Eva, but the Entry Plug has been ejected. 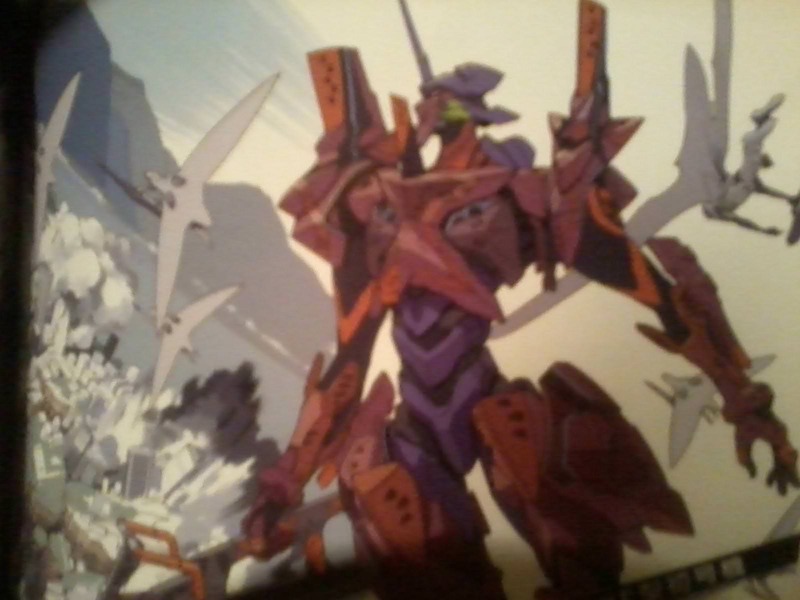 Unit 00 is in its F-type configuration and has the Angel's Spine equipped on its arm, but otherwise it's not doing anything. In the background you can see the damaged city and Geofront with the Evas circling overhead. It's really cool and I hope a quality scan surfaces eventually. I'm pretty sure this was depicted with model kits when it originally ran in Dengeki Hobby. The rest of the book is just plain text with some black and white images. I didn't count but I'd guess there are about 12-15 illustrated pages in all. I was really hoping these would be in color or semi-color. Some of Yamashita's busy designs don't read all that well with this quality. Then at the back of volume 1 there are some pages of character designs for the main characters, the Evas, equipment and so on. Volume 2 just has a basic line-art drawing of vanilla Eva-03 (or it could be 4 since there are no markings) and a carrier plane. They're nice little volumes in all and I'm sure they'd be great if you can read Japanese, but if you're just looking for the art then I don't think this is going to do much for you. Even more edits! I tried to take some photos of the stuff I was talking about. Unfortunately my ancient phone has the resolution of an old potato but you can mostly make things out! My copies will hopefully make it here next week. Since I'm a bit impatient could you take pic of the index page if there is any? Nice to see that there's a few more new images than just the book covers. Everything else sounds about as expected of compiled light novels. One thing to note that was in an amazon review is that apparently Hiroyuki Utatane's character art got omitted. Maybe saving that for a full artbook?